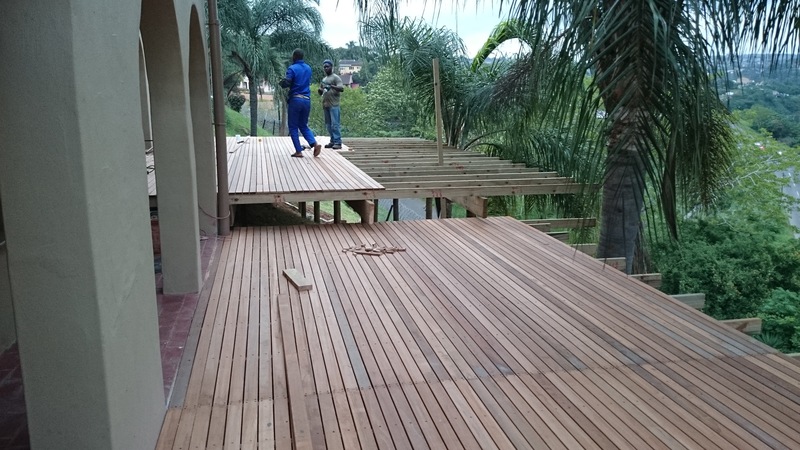 We recently had a good run of building wooden decks in Durban. 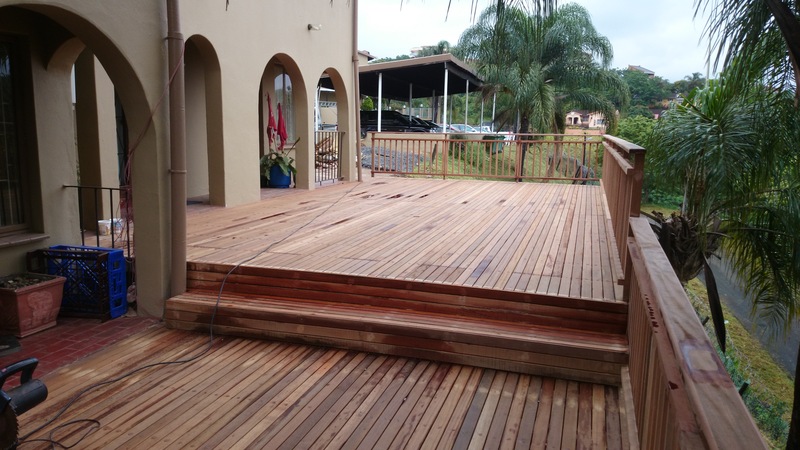 With the arrival of summer and Christmas, wooden decks in Durban become a very popular item for consumers to spend their hard-earned cash. Despite trying to get jobs confirmed earlier on in the year, most of our work was confirmed in November and hence we have been running 2 to 3 sites simultaneously. It’s no easy task with the size of our current crew, but we were lucky enough to have most of them take place north of Durban in Durban North, Umhlanga and this one in Verulam. We rented an old beach cottage near Ballito and stayed there with our full crew for 3 weeks so that we didn’t need to fight traffic in the mornings or afternoons and drop and pick up staff in various different areas. However the traffic in Umhlanga and that whole north of Durban area is beyond ridiculous so it still took us hours to get “home” each day. This coupled with the fact that we had a lot of work to get through, made for very early starts and very late finishes. The pics alongside are work in progress pic and I will update then once we have sanded and sealed the deck. This job in Verulam was at a complex and this part of the complex consisted of 6 units. 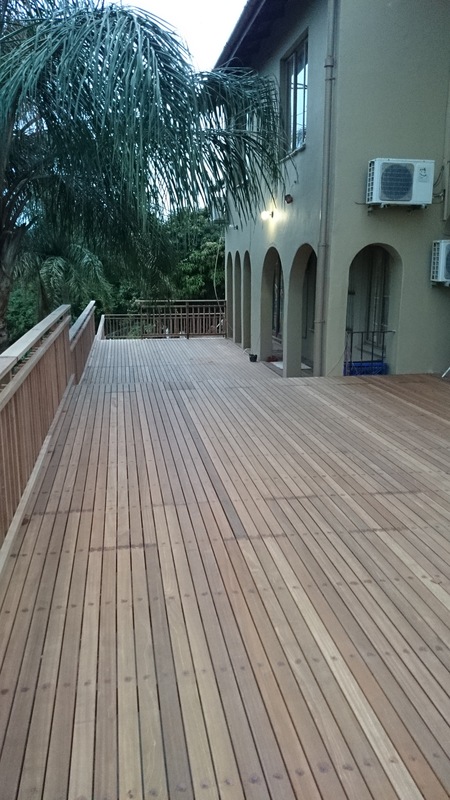 We built 3 wooden deck sections, each of about 45m². There was a wooden balustrade on the front of it and on the two ends or sides. 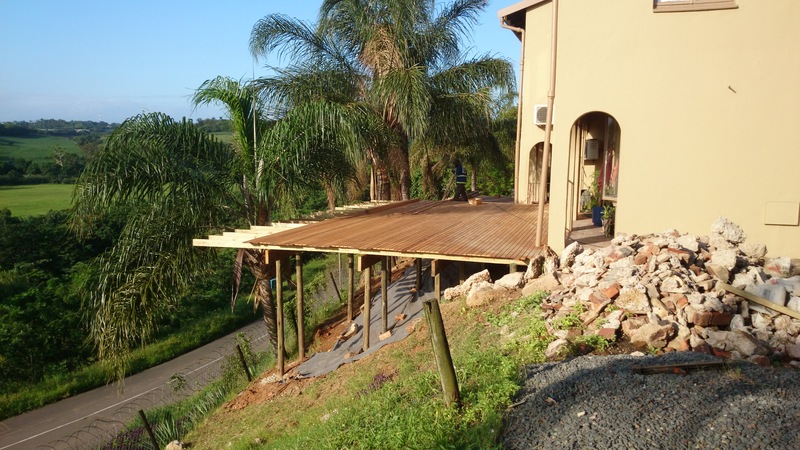 The drop down from the first section of wooden deck was about 450mm so we created a step along the entire width of the deck with closed risers. For these closed riser steps we use a mini substructure and then deck it using the standard 19 x 68 balau deck boards. It then becomes a sort of bench as well as a step down. 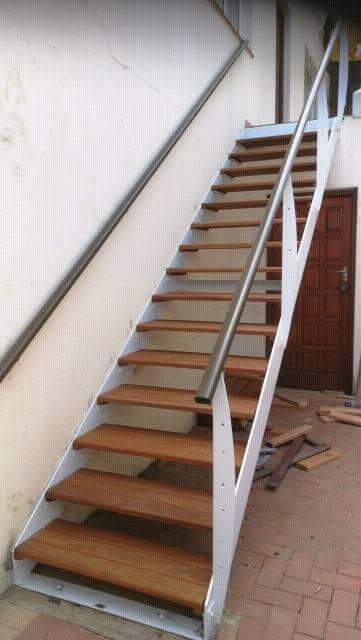 The step down from the second wooden deck section to the third was about 1, 100mm so we had to build some wooden stairs with open risers of standard width of 1m and clad the section were there were no stairs. We also clad behind the stairs in order to block of the underneath of the deck completely. These wooden stairs were the straight forward design with stringers on either side, and treads placed inside of the stringers using cleats on each side. Hence the risers are open which is why we clad behind it to block off the underneath of the second section. We used 30mm x 102mm stock to build the stairs as there is no support beneath them over the 1m span. Using 30 x 102 stock with no gaps, as opposed to 30 x 140 stock, results in a tread of 306mm compared to 285 (140 + 140 + 5mm gap). So they are slightly wider (by 21mm) but still very comfortable. Also we get to use our 1m off cuts from the capping on the balustrade thereby reducing our cost which we can pass on to our clients through our reduced selling price. It was a fairly straightforward build but did take a bit longer than other jobs as the front of the wooden deck was directly in line with where the bank below suddenly dropped off. So it was difficult to work at head height on a very steep slope. Ladders had to be tied off to the posts to climb them and so on. 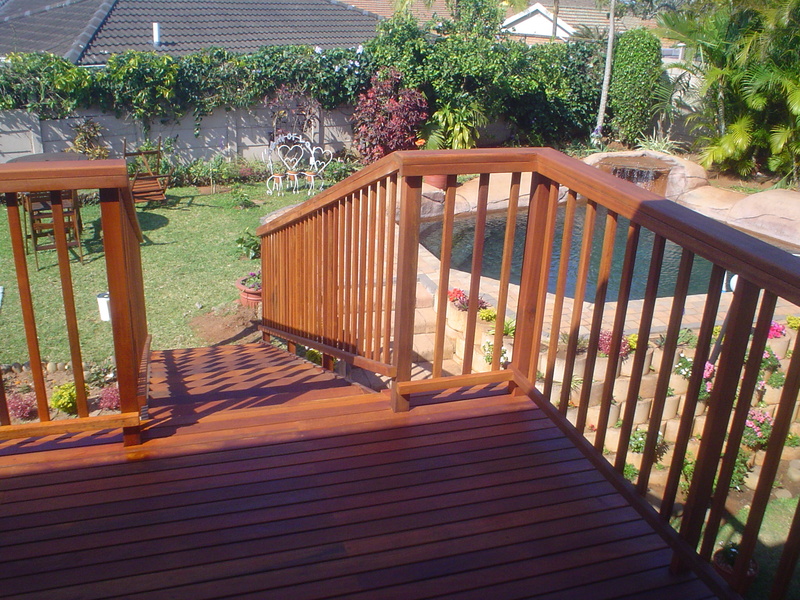 For a free, no obligation quote, on your wooden deck, pergola, walkways, stairs and other outdoor and indoor timber construction please call us on 031 – 762 1795 or use the contact us form below. This wooden stair job started off as just a few stairs to gain access to the granny flat from the other side of the garden and then progressed into a small balustrade on either side too. 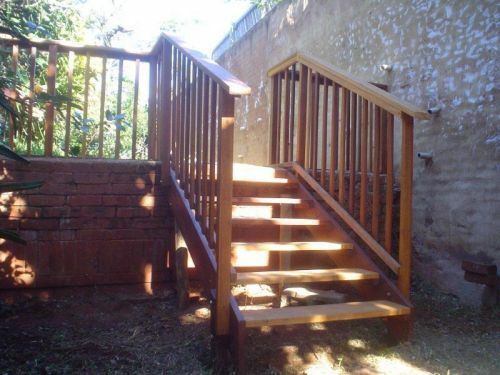 The client originally had a fence there of CCA pine slats which we had to remove and then build our stairs. She wanted to then put some sort of fence on either side to keep dogs out and originally we were going to re-use some of the CCA pine slats. After speaking to her we agreed that a balau balustrade at the same height as the stairs would finish it off more neatly and add more value to her property. 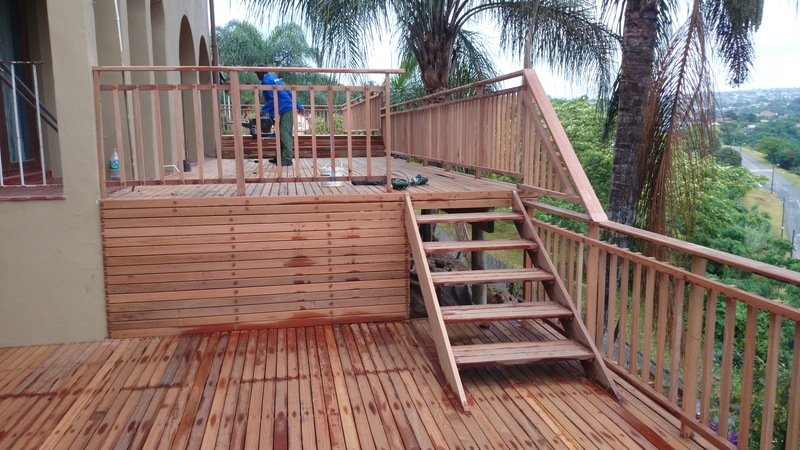 The stairs were fairly simple and we used two stringers on each side of 30 x 228 balau. We then attached cleats at the required height for each tread. For the cleats we used 30 x 40 balau and for the treads we used 30 x 140 and doubled them up to get a tread of 285 wide with a 5mm gap in between each board. This type of stairs can only really be about 1m wide before you need to increase the thickness of your timber to 40mm. If the timber is too thin and the steps are too wide then the tread will bend each time someone walks on it. If you want to make your stairs wider than 1m then you must use a 40mm thick piece of balau. If you are using pine then this thickness needs to be increased even more because pine is so much softer than balau. I prefer to use a different system when building wide stairs. One can add an extra stringer in the middle to give it support. However the stringers on the end have the cleats attached to the inside of them. The stringer in the middle cannot have the cleat attached to the inside as the stringer itself will protrude above the level of the tread. So you will need to cut recesses out of the middle stringer so that the tread can sit on a flat surface. The other alternative to this is to build a structure underneath each tread on which deck boards are attached. This method is common in building stairs with closed risers. The above method and the one we used on this build is common for stairs with open risers. We had a challenge on this job in that the wall that we were going to attach to wasn’t straight and looked as if it had been moving over the years. So instead of attaching to the wall we sunk some posts in the ground and concreted them in. This way the wall can continue to move without pushing or pulling our stairs over. We filled our holes with epoxy and saw dust mixture to get a colour match and sealed it this time using Timberlife Ultra Care Gold. 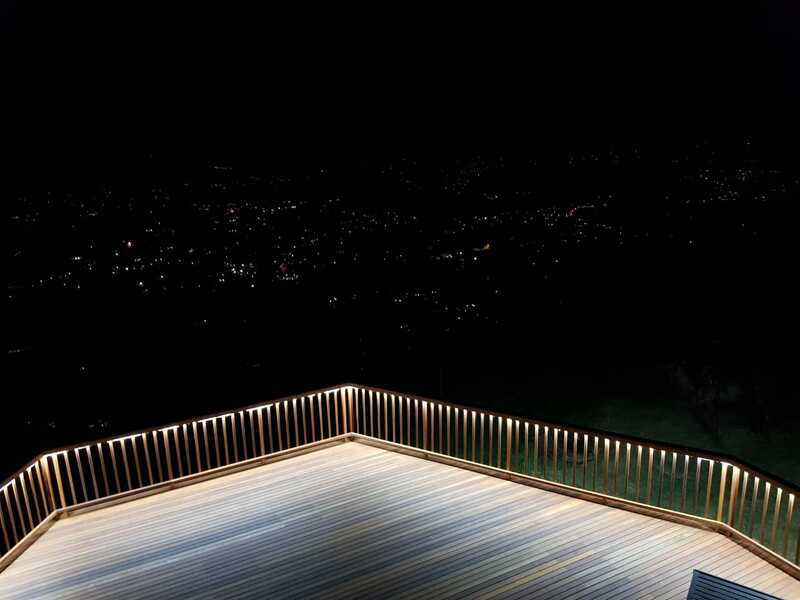 The Ultra Care Gold has a higher wax content and is suitable for vertical pieces of timber where the sun’s rays are not as direct as the horizontal pieces. I went back to this client’s house to repair a broken fence and our stairs and balustrade are still as good as they were when we built them. They need to be re-sealed again but otherwise the balau has held up well. 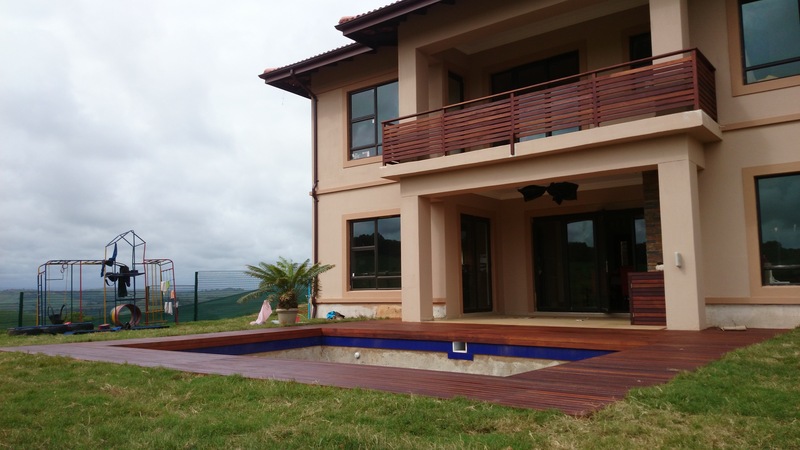 For a free no obligation quote on your outdoor timber construction please call us on 031 – 762 1795 or use the form below to submit your enquiry. If it’s just advice you are after, leave a comment in the comments section and I will try to assist you. 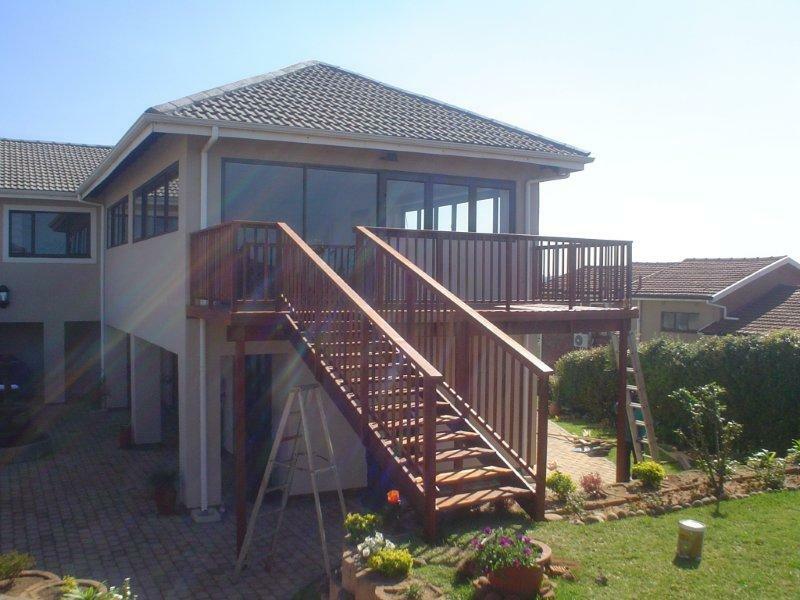 This was one of my first wooden decks in Durban that I undertook. The Guest House we built it for had just opened up the side of the dining room on the first floor with sliding doors and now wanted to extend the area by adding a deck of about 14m². It is always important to first break through the wall and install the sliding doors and then build the wooden deck. This way the deck builder can get the surface of the deck flush with the entrance to the room. 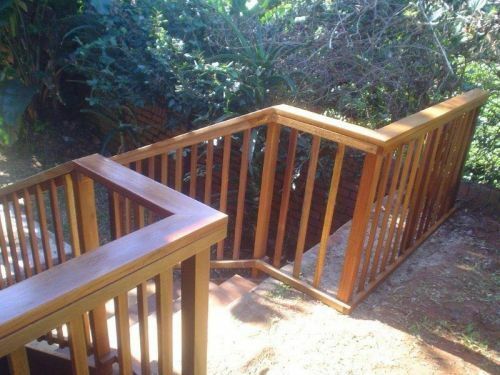 I have built one deck before where the client insisted that I build the deck first and then they were going to break through. Although we did our best to measure where the inside floor was, there may still have been a small step up or down once they had broken through. On this build though it was done the right way around and the deck was flush with the floor inside the dining room. The deck was a normal cleat, beam and joist system where we secured a cleat to the wall with sleeve anchors, installed vertical posts and attached a beam to that and then ran joists between the cleat and beam with a small canter lever. We had to try to set our posts as far out as possible so as to create enough space under the deck that could be used. The balustrade was a normal picket style one. These are the safest and really the only one that is completely compliant with building regulations. Building regulations state that there should be no opening that is larger than 100mm. With all other balustrades there are some spaces that become greater than 100mm. Besides being non-compliant they are not that safe especially for small children. With the pickets running in a vertical direction it is more difficult for children, or adults, to climb up on the balustrade and fall over. The other designs offer more horizontal pieces that people can use to climb up on. The stairs we built here joined the deck to the pool area which was about half a floor up from ground level. 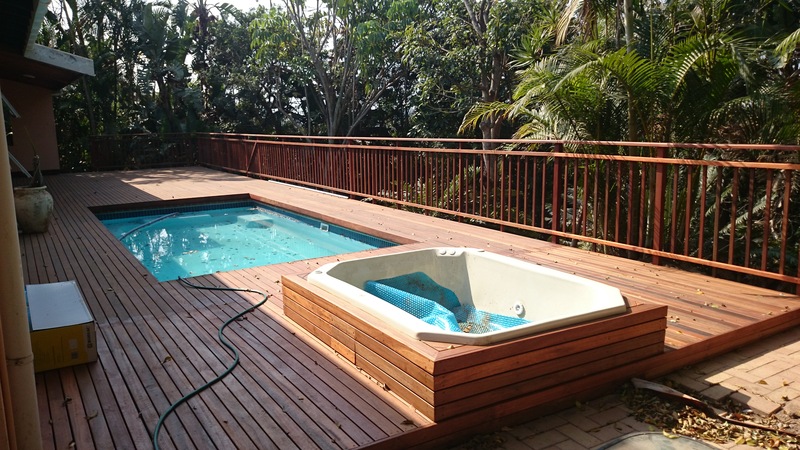 There were separate concrete stairs running from ground level to the pool area but the new wooden stairs we built could now be used to access the pool area, and the rest of the outside area, from the dining room. Because there was no way of supporting the stringer mid-way we had to ensure that we had the correct width of stringer so that it would not break over time. Most of the strength in a piece of wood is in the width and not the thickness as the downward force is exerted on the width. We finished up by filling our holes with epoxy and sawdust and sealing with a Timberlife Satin Wood Base 28 Mahogany tint. In our decks we counter sink the screws which leave a small screw hole that water can get into. It is important to fill these so that no water can get in. If water does get in it can travel down the end grain and will cause the wood to rot much quicker at the point of the screw hole. Water travels through wood along the end grain rather than being absorbed from the face or side grain. Wood filler is also not suitable as it will pop over time due to the weather. Clear epoxy works well mixed with a little saw dust to match the colour. Once it’s dry, use a grinder with a sanding pad to flat it and then sand the grind marks off before finishing. 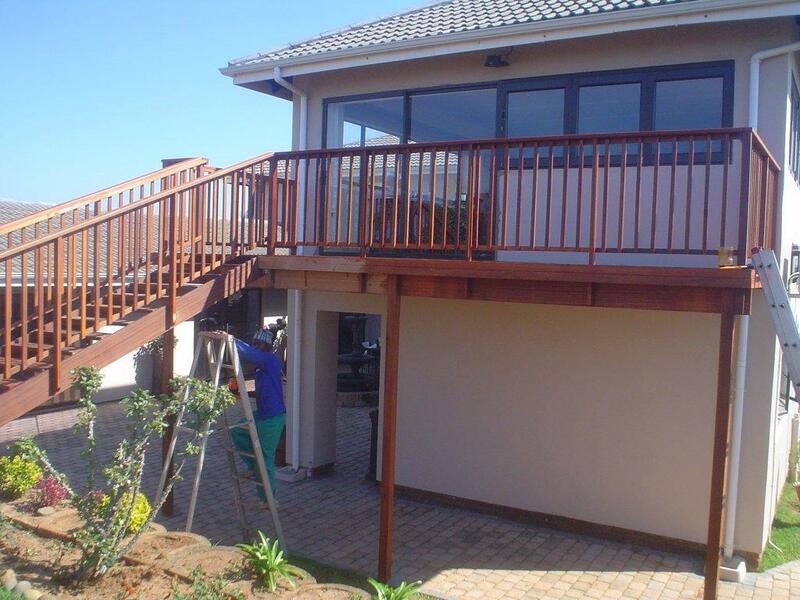 For a free no obligation quote on your deck or for some advice, please contact us on 031 – 762 1795 or complete the form below.